My first foray into radioactive random numbers was in 1986, when I built a card that plugged into the IBM PC bus and attached to the modified Heathkit RM-4 Geiger tube radiation monitor in precisely the same way the first generation HotBits interface did. I used a 10 microcurie 137Cesium source to generate radioactive decay events. Seen from a decade later, this design is horribly over-complicated. All of the timing is done in hardware, using an Intel 8254 counter/timer chip gated by the pulses received from the detector. But remember that this board was intended to be plugged into an IBM PC/AT, an 80286 machine which ran at a blazing clock rate of 6 MHz. Software timing of pulses would have been far less reliable than with present-day machines. 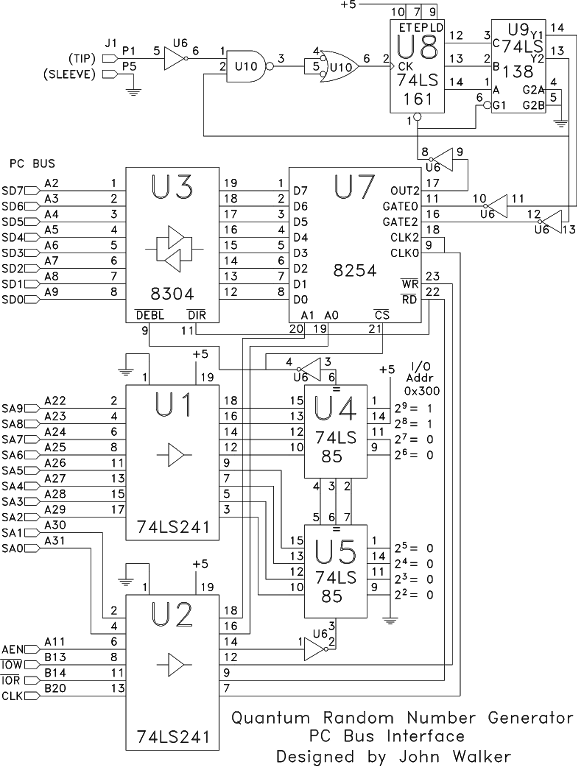 Most of the components in this design are there solely to interface with the IBM PC bus and have nothing to do with actually timing the pulses. Anyway, I wire wrapped up one of these on a half-card prototype board, plugged it in, and after a little debugging with an oscilloscope and an extender card, it worked like a champ. The board still exists, but I can't show you a picture of it since it's still plugged into my original PC/AT, which is locked in a store-all in North America along with the rest of the contents of my Autodesk office (including the carbide cannon).